Biological evolution is a theory, but that is not a weakness. A theory in science gets a specific definition: it is an over-arching generalization that explains and makes sense of a given set of phenomena. A theory can be tested, has potential to be falsified, and has predictive power. Data ultimately decide whether or not a theory is rejected or modified. Biological evolution is supported by data to be an effective explanation for many biological phenomena. For example, the groups-within-groups arrangement known as the hierarchy of life is the predicted end result of descent of modification from a single, common ancestor – we would predict there to be general traits shared by all organisms, followed by more and more exclusive traits shared by groups with more recent common ancestry, producing a groups-within-groups hierarchy. As another example, descent with modification over a long time would produce a sequential fossil record, such as the one we find around the world. The basic sequence of vertebrate evolution is the same everywhere you look in the rock record – birds never appear before fish in the fossil record, for example. Evolution is no different than your family tree … except over a much longer period of time. At its base, all of us recognize the family tree concept and its application in our own lives. For example, I share a common ancestor with my siblings – my mother and father. Further back in my family tree, my siblings and I along with our cousins share another, more distant common ancestor – our grandparents. Moving out to my second cousins, I share an even more distant common ancestor with them – our great grandparents. Take the common ancestry back several more generations, and we quickly approach a common ancestor for all of humanity. Beyond this, the family tree’s scope enlarges to encompass more distant common ancestors, such as those shared with other animals, plants, and eventually all living organisms on earth. Every living thing on earth is related. 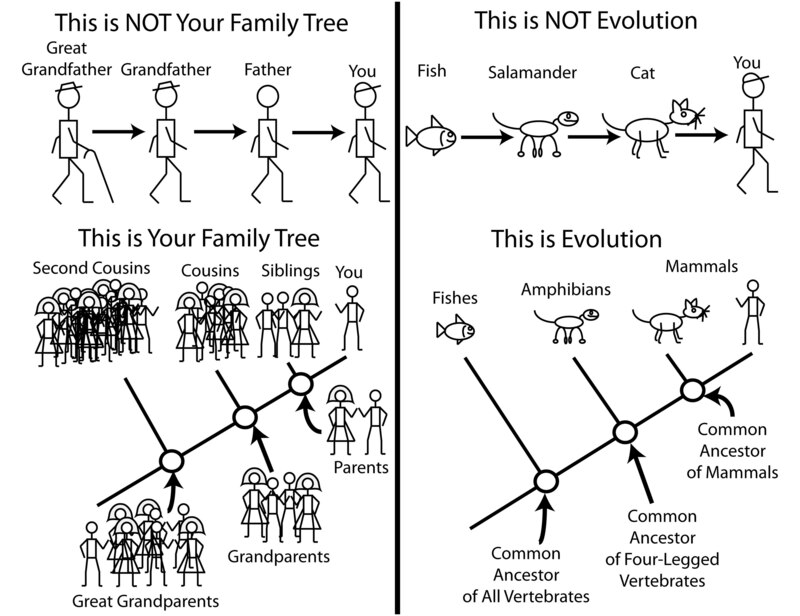 All vertebrate animals, including us, have a common ancestor. Go Back to What is Evolution? What is Science?